Latest from TVGuide's Mega Buzz spoiler column. Hit the 'read more' button for some spoilers / theories about Harrison in upcoming episodes on the season! "It could just be me, but I'm starting to worry that Harrison may end up killing Jaime. That's right, Dexter's son seems to be on the path to getting into the family business, so to speak. Sure, he's only 4, but he was — like Dexter — born in a pool of blood, so to speak. 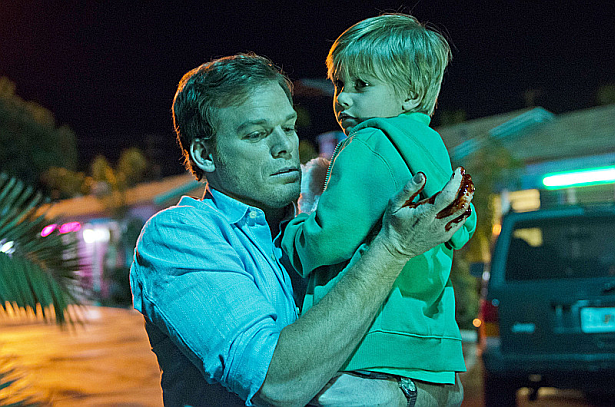 Meanwhile, that promo that shows what appears to be Dexter being caught is a little misleading. Nevertheless, Dexter will take a risk that could get him caught."